I promised myself I wouldn't turn this into Wildlife Week or Photo November, but when the picture presents yourself, take it. The problem is something that real Wildlife Photographers will tell you happens to them frequently. Your subject does not always cooperate and I won't call myself a Real Wildlife Photographer, since I am far too modest. While I was in the kitchen making my third mug of coffee (Decaf by this time in the morning) I looked out through the kitchen window at the yard and noticed my Rabbit has a Visitor. We found that rabbit sculpture buried in the back yard under all the weeds and plants that were put there to add color. I recently attacked all of that with the weed-eater, and if you don't think that a weed-eater could be theraputic, come on by and I'll let you go at the yard. Since Summer has ended, and Fall is here with its beautiful temperatures when we aren't having torrential downpours, the outdoors calls to you. Gentle breezes from the ocean, low humidity, brilliant cerulean skies, "Simpsonian" clouds and bright sun caress your skin and beckon you to come out to play-ay like the Warriors. +2 Internets if you get that reference! I completely denuded the area below the bougainvillea and had to be restrained not to "sculpt" the blasted plant into oblivion. While there, destroying plant matter and the sprinkler system alike, I had to stop when the head of the weed-eater threw off its titanium core. Reaching down for the part, and scaring off the last of the critters that were cowering in the Lititrope that was soon to be gone, I found it... the resin head of a brown rabbit. 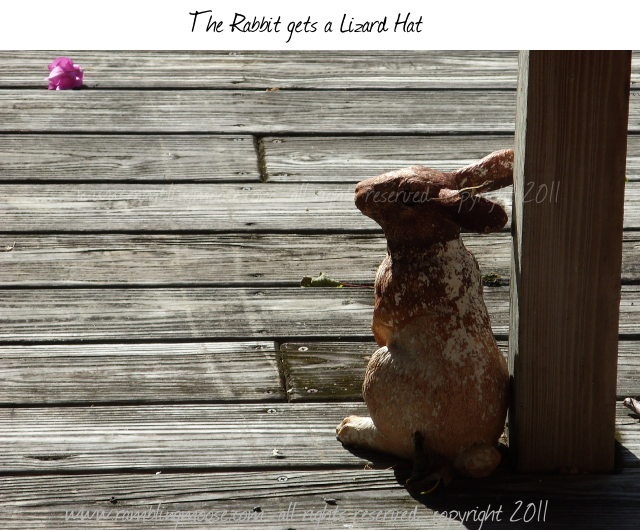 It actually is a white rabbit, Alice, but the rust and brown from the yard lent it character. I'm also not prone to taking a toothbrush and tilex to an outdoor sculpture. It moved from place to place until it found its home under the bar on the deck. There, it was claimed by a Cuban Brown Anole. You see they have territories. Each little critter will claim a spot for the Crown and Queen and protect it with all of its crittery life. This little one entertained me many times while sitting at my desk trying to fix something with soldering iron by jumping from the bicycle to the post to the head of the rabbit. What reminded me of all of this is that one of my Facebook friends, Karyna, has a boyfriend who she calls the Rabbit. I'm not going to second-guess her, it sounds rather cute to me... But since she's not the lizard the simile isn't quite accurate. Every time I see the little statue guarding my back door, now I think of Karyna. I'll keep trying for the perfect picture, but this one is pretty close. Since they're quite fearful, it will be a challenge. It's turning out to be a wildlife day. This morning I've been landed on and transported a ladybug, found ants in the bathroom, and now my lizard visit. Probably around dinner the buzzards will be back for a visit and I know I'll find Monarch Butterflies in the yard drifting on the breezes. As long as it isn't a Mosquito, I'll be happy.